Vegetable Meatballs with Pumpkin – Welcome to Creative Rajni! This is meatballs with an exception of meat. Instead of meat, I have used pumpkin and potatoes. In Kerala, as an evening snack, vegetable patties(or vegetable cutlet) like these are made for tea. This curry is made similar to the vegetable cutlets. 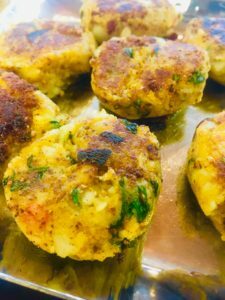 These are pumpkin and potatoes sauteed with shallots and flavorful spices and made into patties or balls and finished off with a wonderful cashew gravy with cardamom. Chiffonade- It is a way of stacking all the leaves one on top of the other, rolling it and then cutting into thin strips. Heat a non stick pan and add coconut oil to it. Once hot, add in cumin seeds, curry leaves and chopped garlic. After a minute, add in the shallots and let it brown for about 3-4 min. Add in the spices-coriander, paprika, turmeric powder, salt, cinnamon, nutmeg, white pepper, chia seed powder and saute for 30 seconds on medium heat. Now add in the tomatoes and mix well. Cook for 8-10 min until the tomatoes are totally mashed into the shallots. This is a thick shallot and tomato sauce. Add in fresh coriander leaves. Check the salt at this point and add more if need be. Stir well. Add in the mashed pumpkin and the potatoes and mix well to combine. Transfer this to a mixing bowl and add in panko breadcrumbs and mix well. Add in enough breadcrumbs so that you can make patties out of this mixture. Make patties and keep aside. At this point you have 2 options to proceed further- 1- You can sauce this patties as it is in 1 tbsp of coconut oil or 2- you could pat each patty into flour, then dip it into a beaten egg and then again pat into flour, and fry then in coconut oil. The patties are ready. Keep them aside. Next to make the gravy- Heat another deep pan and add coconut oil, add in shallots and sauce it well until light brown. In a blender add in the cashews along with very little water, the shallot mixture and grind it thoroughly. Slowly add in little water at a time until well blended into a smooth sauce. Add in water according to your level of consistency. Check for salt and pepper and the gravy is ready. To serve, in a plate, place 2 patties and pour the cashew sauce on top of the 2 patties and serve along side with hot, fluffy basmati rice.